For other people named Mary Berry, see Mary Berry (disambiguation). 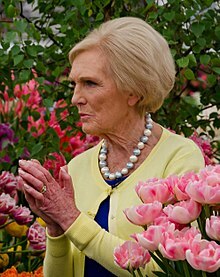 Mary Rosa Alleyne Hunnings CBE (née Berry; born 24 March 1935), known professionally as Mary Berry, is a British food writer and television presenter. After being encouraged in domestic science classes at school, she studied catering and institutional management at college. She then moved to France at the age of 21 to study at Le Cordon Bleu school, before working in a number of cooking-related jobs. from the BBC programme Desert Island Discs, 29 July 2012. She has published more than 75 cookery books, including her bestselling Baking Bible in 2009. Her first book was The Hamlyn All Colour Cookbook in 1970. She hosted several television series for the BBC and Thames Television. Berry is an occasional contributor to Woman's Hour and Saturday Kitchen. She was a judge on the BBC One (originally BBC Two) television programme The Great British Bake Off from its launch in 2010 until 2016. Berry was born on 24 March 1935, the second of three children, to Margaret (‘Marjorie’, née Wilson; 1905–2011) and Alleyne William Steward Berry (1904–1989). Alleyne was a surveyor and planner who served as Mayor of Bath in 1952 and was closely involved in establishing the University of Bath at Claverton Down. Mary's great-great-grandfather on her father's side, Robert Houghton, was a master baker in the 1860s who provided bread for a local workhouse in Norwich. Her mother Marjorie was a housewife who, on occasion, helped Berry's father with bookkeeping. Her mother died in 2011 aged 105. At the age of 13, Mary Berry contracted polio and had to spend three months in hospital. This resulted in her having a twisted spine, a weaker left hand and thinner left arm. She has said that the period of forced separation from her family while in hospital "toughened [her] up" and taught her to make the most of every opportunity she would have. Berry attended Bath High School, where she described her academic abilities as "hopeless" until she attended domestic science classes with a teacher called Miss Date, who was particularly encouraging of her cooking abilities. Her first creation in the class was a treacle sponge pudding which she took home, and her father told her that it was as good as her mother's. She then studied catering and institutional management at Bath College of Domestic Science. Berry's first job was at the Bath electricity board showroom and then conducting home visits to show new customers how to use their electric ovens. She would typically demonstrate the ovens by making a Victoria sponge, a technique she would later repeat when in television studios to test out an oven she had not used before. Her catchment area for demonstrations was limited to the greater Bath area, which she drove around in a Ford Popular supplied as a company car. Her ambition was to move out of the family home to London, something which her parents would not allow until she was 21. At the age of 22, she applied to work at the Dutch Dairy Bureau, while taking City & Guilds courses in the evenings. She then persuaded her manager to pay for her to undertake the professional qualification from the French Le Cordon Bleu school. The temporary move to France came as a culture shock; she could not help but cry all the way through her first meal, consisting of horse meat, reminding her of the pony she had left behind at home in Bath. She left the Dutch Dairy Bureau to become a recipe tester for PR firm Benson's, where she began to write her first book. She has since cooked for a range of food-related bodies, including the Egg Council and the Flour Advisory Board. In 1966 she became food editor of Housewife magazine, and when she had children, she only took five weeks' leave on each occasion, as there was no set maternity leave at the time and each time she risked her post being filled by someone else before she was scheduled to return. She was food editor of Ideal Home magazine from 1970 to 1973. Her first cookbook, The Hamlyn All Colour Cookbook, was published in 1970. She launched her own product range in 1994 with her daughter Annabel. The salad dressings and sauces were originally only sold at Mary's AGA cooking school, but have since been sold internationally around Britain, Germany and Ireland with retailers such as Harrods, Fortnum & Mason and Tesco each stocking the product ranges. She has also appeared on a BBC Two series called The Great British Food Revival, and her solo show, Mary Berry Cooks, began airing on 3 March 2014. In December 2012, Berry became the first president of the new Bath Spa University Alumni Association. In her own kitchen, she uses a KitchenAid mixer which she describes as being the one gadget she could not live without. She has always had an AGA cooker, and used to run cooking courses for AGA users. She describes Raymond Blanc's restaurant Le Manoir aux Quat' Saisons as one of her favourites as well as the Old Queen's Head, local to where she lives in Penn, High Wycombe. In February 2015 Berry featured in a programme in aid of the Third World charity Comic Relief. In May 2015 she began presenting a new BBC Two series called Mary Berry's Absolute Favourites. In November 2015 she was the subject a two-part biographical documentary entitled The Mary Berry Story. Starting on 30 November 2015, she was one of the two judges for a four-week American edition of the popular baking competition The Great Holiday Baking Show on ABC, which followed a similar format to the British competition. In November 2016, it was announced that Berry would present a new six-part series, Mary Berry Everyday in which she would share her cooking tips, family favourites and special occasion recipes. The show aired on BBC Two, it has since been shown on BBC One on Saturday mornings. In April 2017, Berry launched a series of cakes that could be bought from supermarkets. The cakes contain emulsifiers and preservatives that Berry has previously described as "unwanted extras". On 27 September 2017, Berry opened the newest Chesham Grammar School Food Tech kitchen. From 22 November 2017 to 13 December 2017, Berry presented a 4 part series called Mary Berry's Country House Secrets on BBC One. In this series, she ventured to four of the UK's most prestigious stately homes and explored each through the prism of food and history. The locations included Highclere Castle, Scone Palace, Powderham Castle and Goodwood House. In 2018, Berry was a judge on Britain's Best Home Cook alongside chef Dan Doherty and Chris Bavin. From 2010 to 2016 she was one of the judges on BBC One's The Great British Bake Off alongside baker Paul Hollywood, who specialises in bread. Berry says that since working together, she has learned from him. However, some viewers were outraged during the first series when a decision was made to make the contestants use one of Hollywood's recipes for scones instead of one of Berry's. Her work on the show with Hollywood has led to The Guardian suggesting that it is the best reality TV judging partnership ever. In September 2016, Love Productions announced that a three-year deal to broadcast the show on Channel 4 instead of the BBC from 2017 had been agreed. Co-hosts Mel Giedroyc and Sue Perkins announced that they would not be continuing with Bake Off on its new network. Berry announced she was also leaving Bake Off on the same day that fellow judge Paul Hollywood announced he would be staying with the show. Berry was appointed Commander of the Order of the British Empire (CBE) in the 2012 Birthday Honours for services to culinary arts. In July 2012, she was given an honorary degree for her lifelong achievements in her field by Bath Spa University which incorporates the former Bath College of Domestic Science. On Saturday 7 June 2014, Berry was awarded the Freedom of the City of Bath, during the Mayor Making ceremony at Bath Abbey; and, having already received the Freedom of the City of London, on 19 November 2014, she was clothed with the livery of the Worshipful Company of Bakers. She was awarded the Specsavers National Book Awards "Outstanding Achievement" prize in December 2014. On 25 January 2017, Berry won the award for Best TV Judge at the National Television Awards for Great British Bake Off. Berry married Paul John March Hunnings in 1966. He later worked for Harvey's of Bristol and sold antique books. He is now retired. The couple have three children: Thomas Alleyne March, a tree surgeon and a father of three, and Annabel Mary March (married to Charles William Dan Bosher, a master builder), a mother of three who went into business with her mother to market salad dressings. A second son, William John March, died in 1989, in a car accident aged 19 while a student at Bristol Polytechnic. Thomas and William both attended Gordonstoun School. Berry is a patron of Child Bereavement UK. In March 2013, Berry was placed second in a list of the fifty best-dressed over 50s by The Guardian. In September 2014 Berry was the subject of the BBC genealogy series Who Do You Think You Are? and discovered among her ancestors illegitimacy, bankruptcy and a baker. Berry is a member of the Church of England and has been worshipping at Holy Trinity Church in Penn since 1989. She wrote about the church, and her membership, on the "UK's favourite churches" website. Her mother, who died in 2011, had also been an active church member. As part of the BBC2 programme "Mary Berry's Easter Feast" at Easter 2016, Berry visited Bishopthorpe Palace, the official residence of the Archbishop of York who is the second most senior cleric in the Church of England, and filmed a special "Cooking with the Archbishop" segment. Berry has written more than seventy cook books since her first book was published in 1970, and has sold over five million cook books. She regularly works on her cook books with Lucy Young, who has been her assistant for over twenty years. Her bestselling Baking Bible was rated one of the ten best baking books by The Independent. Since September 2014, Berry's recipes have also been packaged in an interactive mobile app called "Mary Berry: In Mary We Trust". Her autobiography, Recipe for Life, was published in 2013 by Michael Joseph. ^ a b c d e f g h i Pownall, Elfreda (11 September 2011). "Mary Berry: queen of cakes". The Daily Telegraph. London. Retrieved 31 March 2012. ^ "Mary Berry". Desert Island Discs. 29 July 2012. BBC Radio 4. Retrieved 18 January 2014. ^ "Persons with significant control". beta.companieshouse.gov.uk. Retrieved 3 February 2018. ^ "Mary Berry: A long line of determined business people that had tremendous energy and drive...", The Genealogist, 11 September 2014. ^ a b c d e f g Foster, Jill (8 October 2011). "All rise for Mary queen of cakes! Great British Bake Off judge shares a few slices of her wisdom". The Daily Mail. London. Retrieved 31 March 2012. ^ Nick McGrath, "Mary Berry: My family values", The Guardian, 3 November 2012. Retrieved 20 October 2014. ^ Berry, Mary (26 January 2013). "'My childhood polio helped me survive the darkest days of my life': Mary Berry reveals how she coped with her son's tragic death". The Daily Mail. London. Retrieved 26 January 2013. ^ "Mary Berry". UKTV Food. Retrieved 31 March 2012. ^ a b "Mary Berry". Quadrille Publishing. Retrieved 31 March 2012. ^ "Mary Berry's Salad Dressings & Sauces". Mary Berry.co.uk. Archived from the original on 26 January 2013. Retrieved 31 March 2012. ^ Woods, Judith (23 February 2014). "Mary Berry: 'I'm giddy with excitement!'". Daily Mail. London. Retrieved 23 February 2014. ^ "Mary Berry President of new Bath Spa University Alumni Association". Press Release. Bath Spa University. Archived from the original on 12 December 2013. Retrieved 6 December 2013. ^ a b Montgomery, Hugh (14 August 2011). "Mary Berry: 'I freeze leftover wine so I can add it to gravy and cheer it up'". The Independent. London. Retrieved 31 March 2012. ^ James, Laura. "Mary Berry". Aga. Retrieved 6 June 2017. ^ "Aga Workshops". Mary Berry.co.uk. Archived from the original on 2 January 2013. Retrieved 31 March 2012. ^ Plunkett, John (12 February 2015). "Mary Berry's Great Comic Relief Bake Off cooks up 6 million viewers". The Guardian. Retrieved 11 November 2016. ^ "The Mary Berry Story - BBC Two". Bbc.co.uk. Retrieved 11 November 2016. ^ Moylan, Brian (30 November 2015). "The Great Holiday Baking Show: US tries and fails to copy UK super smash". The Guardian. Retrieved 18 November 2016. ^ "Mary Berry lands another BBC show". BBC News. 14 November 2016. Retrieved 15 November 2016. ^ Singh, Anita (7 April 2017). "Mary Berry dabbles in the dark arts of the shop-bought sponge". Telegraph.co.uk. Retrieved 5 November 2017. ^ "Mary Berry to open new food technology room for Chesham Grammar School's 70th anniversary celebrations". cheshamgrammar.org. Chesham Grammar School. 27 September 2017. ^ Annmarie McNaney [@CGSBucks] (27 September 2017). "Our students had a wonderful morning with Mary Berry who officially opened our new food tech room" (Tweet) – via Twitter. ^ "BBC One - Mary Berry's Country House Secrets". BBC. Retrieved 12 February 2019. ^ Ward, Rachel (22 November 2017). "Mary Berry's Country House Secrets was a taste of the high life from the doyenne of dough: review". Telegraph.co.uk. Retrieved 12 February 2019. ^ Heritage, Stuart (7 September 2011). "Mary Berry and Paul Hollywood: the best reality TV judges ever?". The Guardian. London. Retrieved 31 March 2012. ^ Halls, Andy (12 September 2016). "Great British Bake Off to move from BBC to Channel 4 after 'exhaustive' talks break down". The Sun. Retrieved 12 September 2016. ^ Foster, Patrick (12 September 2016). "BBC loses Great British Bake Off, as Channel 4 swoops for corporation's biggest show". The Daily Telegraph. Retrieved 12 September 2016. ^ "Great British Bake Off: Mel and Sue to quit as hosts". BBC News. 13 September 2016. Retrieved 13 September 2016. ^ "Mary Berry to leave Bake Off ahead of Channel 4 move". BBC News. 22 September 2016. Retrieved 22 September 2016. ^ Martinson, Jane (22 September 2016). "Mary Berry to leave Bake Off – but Paul Hollywood agrees to stay". The Guardian. Retrieved 23 September 2016. ^ "Mary Berry receives CBE". The Guardian. London. 16 June 2012. ^ "Bath Spa University announces honorary degrees for 2012". Bath Spa University. Archived from the original on 5 July 2012. Retrieved 20 July 2012. ^ Prideaux, Siobhan. "Bath choir prepares twist on classic song for Mary Berry's visit to the city". The Bath Chronicle. Archived from the original on 22 May 2014. Retrieved 22 May 2014. ^ "BBC News – Mary Berry awarded freedom of Bath during Abbey ceremony". Bbc.co.uk. Retrieved 9 June 2014. ^ Flood, Alison (27 November 2014). "David Nicholls and David Walliams win top prizes at National Book Awards". The Guardian. Retrieved 14 March 2015. ^ Griffiths, Elanor (25 January 2017). "Mary Berry wins Best TV Judge at the National Television Awards". Radio Times. Retrieved 12 May 2017. ^ "Mary Berry opens up to Piers Morgan about the car crash that killed". independent.co.uk. 9 January 2014. Retrieved 11 November 2016. ^ "Child Bereavement UK :: Patrons". childbereavementuk.org. Retrieved 25 January 2018. ^ "BBC One — Who Do You Think You Are?, Series 11, Mary Berry". BBC. Retrieved 13 September 2014. ^ Berry's article at UK Favourite Churches, written in 2013. ^ See Berry's family values comments for The Guardian on-line, 3 November 2012. ^ Referenced at the BBC website. ^ "Cook up a feast". The Press and Journal. 18 December 2010. Archived from the original on 15 December 2013. Retrieved 31 March 2012. ^ Bailey, Pippa (17 April 2014). "10 best baking books". The Independent. Retrieved 6 February 2016. ^ "Mary Berry: In Mary We Trust". App Shopper. Retrieved 8 October 2015.